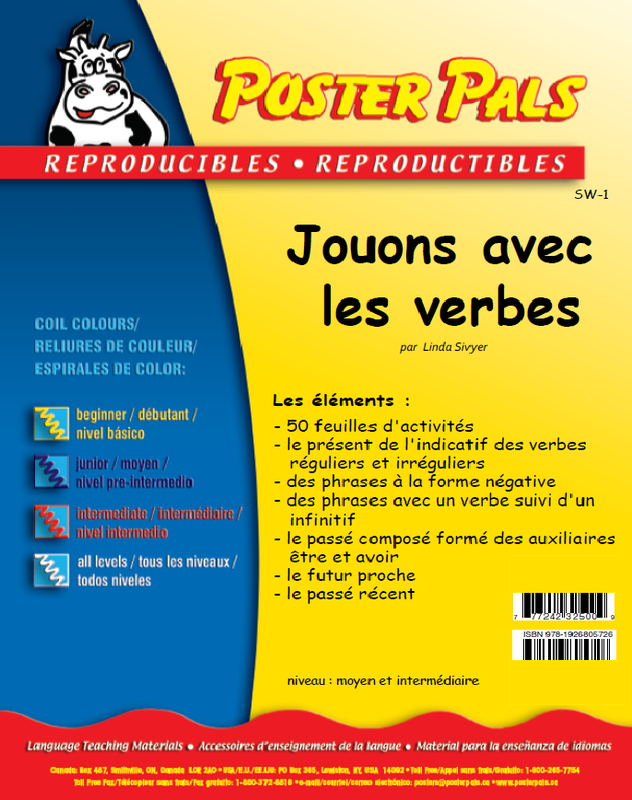 Contents include subject pronouns, verb conjugations in present, passé composé, futur proche and passé récent tenses, affirmative and negative, as well as nouns, adverbs, interrogatives, prepositions and articles (determinants). Construct full sentences, simple or more complex. Text is presented with the option to hear the words pronounced and view their images (where available). Cards can be dragged into position to create full sentences demonstrating correct grammar and sentence structure. Use text alone, images alone or text and images in combination. 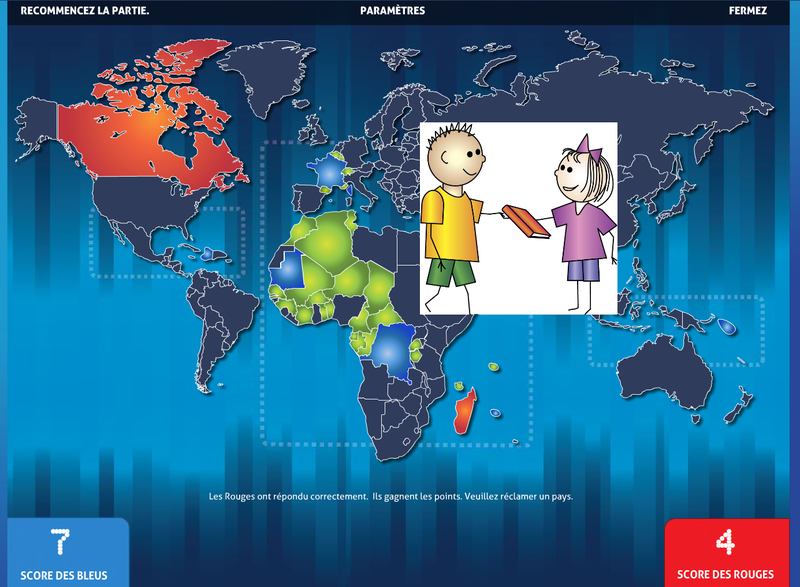 Use this activity review to high frequency vocabulary through images while teaching students the names and locations of French speaking countries. 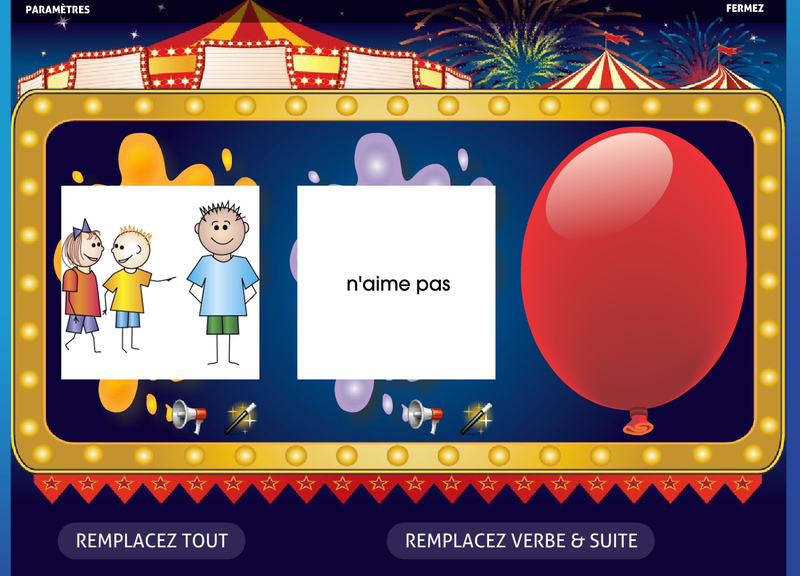 This team game reinforces the learning of vocabulary through images. 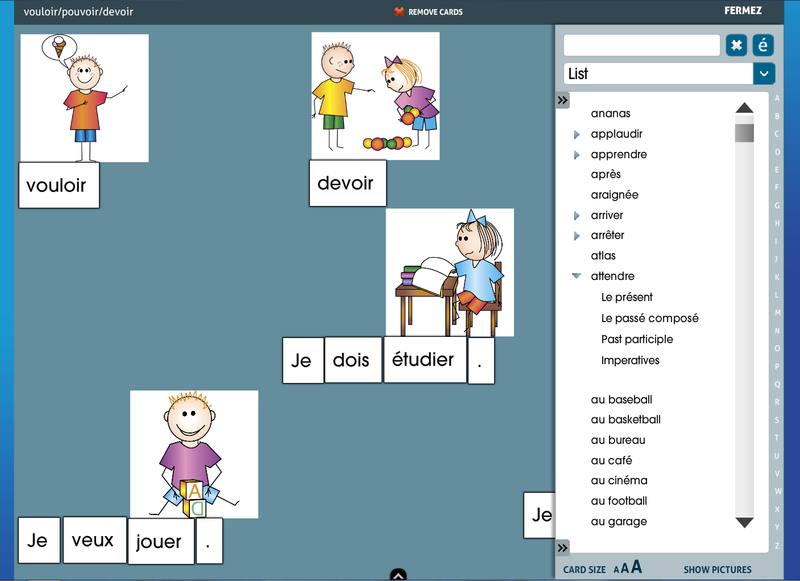 The vocabulary is incorporated into other games and the Lessons portion of this software. 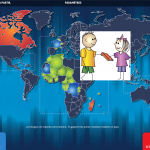 The screen shows a map of the world with French speaking countries of the world highlighted. An image is shown and a team identifies the image. Click on the card to “flip” it and reveal the correct answer. Goal of the game: To finish with the most countries in your team’s colour. This is a listening/reading comprehension game which presents the targeted verbs in the context of full sentences. Questions and answers can be heard aloud to build fluency. 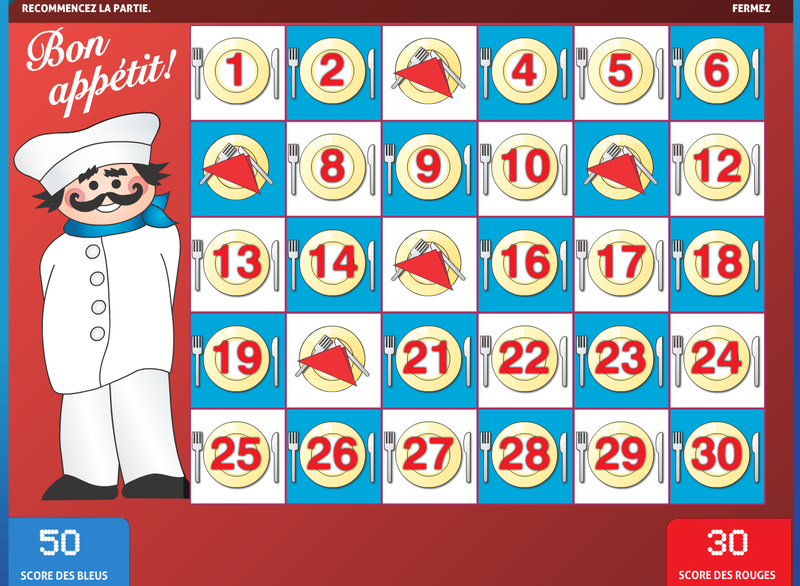 In this game, students read and/or listen to questions and multiple choice answers and then select the correct answer. 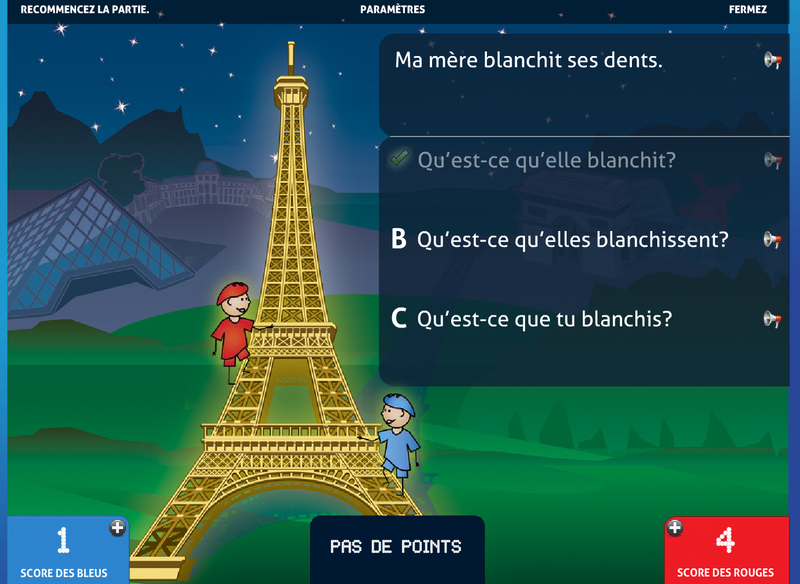 The class is divided into two teams and each team is represented by a climber on the Eiffel Tower. The goal of the game is to be the first team to reach the top of the Eiffel Tower. When a team selects the correct answer, their climber advances one step up the tower. The winning team plants the French flag on the top of the tower. This activity is designed to reinforce subject pronoun and verb agreement, promote complete correct sentence formation and sentence completions. 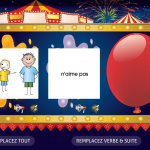 In this carnival game, students pop balloons to reveal images depending on the option chosen to use in making an oral sentence. 1st image: pronoun, 2nd image: verb, 3rd image: direct object or other sentence completion. Answer text is revealed by clicking/touching the cards. This is a sentence building and reading activity. An underwater scene is displayed with a variety of sea creatures and objects which show words, letters, and punctuation. 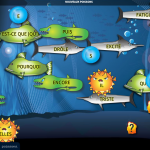 Students can move these creatures and objects into a cave to create various sentences. The creatures are released and new sentences can be created. 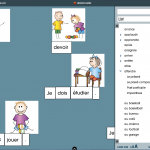 Students can be presented with a variety word types including subject pronouns, conjugated verbs and objects. Students use these words to create sentences. 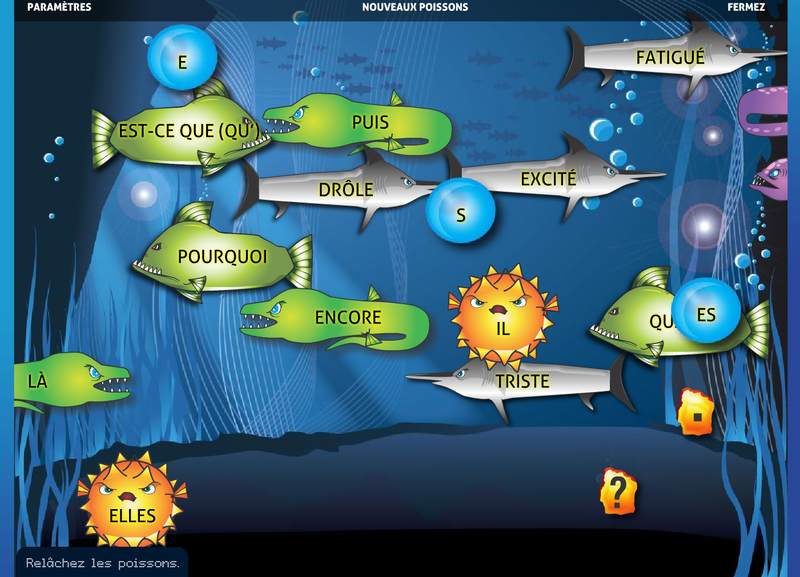 There are options to select either the present or passé composé of regular and irregular verbs, negation, futur proche, interrogatives, adverbs, and other word categories. For present tense regular verbs, there is the option of presenting verb stems and endings for students to match. 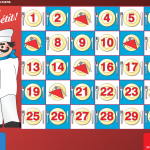 This activity addresses reading comprehension and oral communication. Thirty numbered plates are presented. Each plate hides a question and associated point value or a wild card. The teams take turns choosing plates to reveal questions. The teacher or a student reads the question aloud. A student or team provides an oral answer. The teacher has the option of requiring answers in full or partial sentences, depending on the level of the students. Award the score or offer the other team the chance to respond. Watch for wild cards.